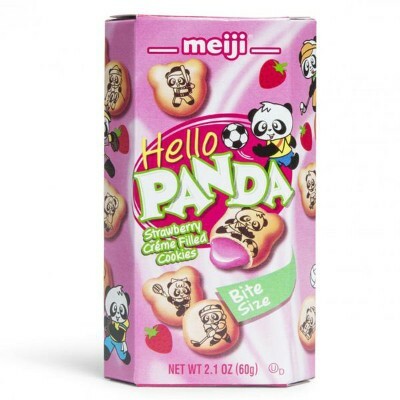 Satiate your sweet tooth while indulging your wild side when you bite into a Meiji Panda Strawberry cookie. 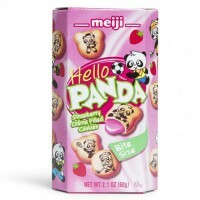 Each panda-inspired cookie showcases a sweet and light strawberry filling, adding a fruity surprise with every delicious bite. 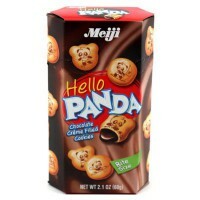 This box features individual packets that are perfect for on-the-go snacking. Don't wait! Only 1 in stock! Wheat flour, vegetable shortening (partially hydrogenated palm, soybean oils), sugar, lactose (milk), skim milk powder, malt extract, seasoning (natural), soy lecithin E322, leavening agents E503ii-E500ii, dehydrated strawberry, salt, color E162, artificial strawberry flavor, acidity regulator E330. 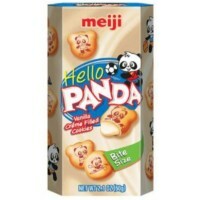 Contain traces of wheat, milk, soy. Nutrition facts (for 100g): calories 533Kcal, total fat 10g (saturated fat 10g), total carbohydrate 60g (sugar 30g), protein 6.7g, salt 0.6g.